At the beginning of every academic term at our Orange County campus, there is a student activity called "A Taste of OC (Orange County)." This activity is designed to introduce our students to local restaurants where they can enjoy special food that is fresh, delicious, and not expensive. 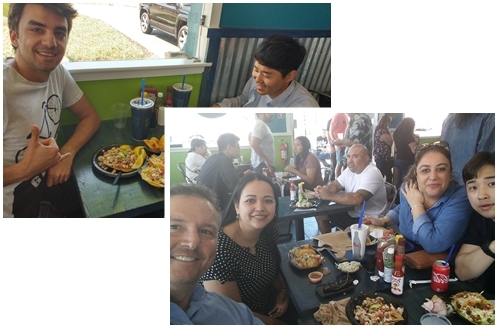 This months Taste of OC activity led students to a place just minutes from our OC campus. 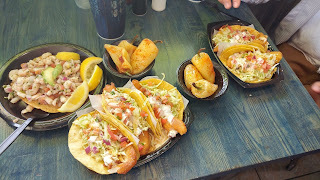 The place is called Baja California Fish Tacos, and their specialty is fresh Baja-style seafood. Baja Mexico is famous for fish tacos that are battered and fried, and on the streets of Mexico, they will only cost you about $1. At the restaurant we visited for the activity, they have a Wednesday special where the fish tacos are only $1.35. This is why the line was out the door! If you take a look at the picture of the food, you will see why this place is so popular. All the students got fish tacos, and one student also ordered the fresh shrimp ceviche. It was so delicious! I'm sure the students will go back some Wednesday in the future to enjoy fresh fish tacos again! !